Wisbech Ladies take to the Olympic Park pitch for their national final. Wisbech Ladies gave a good account of themselves at the Investec Women’s Finals Day at Lee Valley on Sunday (April 30). 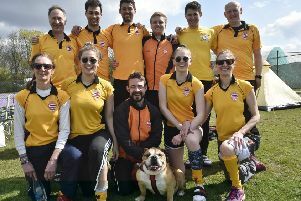 They travelled to the Olympic Park as clear underdogs for the Over 35 Masters Shield Final against a London-based Barnes side crammed with National League players. But the favourites were made to work hard for their 2-0 victory. Barnes started the strongest with all the possession but due to great goalkeeping by player-of-the-match Lorraine Wallis, Wisbech held off the pressure and went into half-time with the scored level at 0-0. Wisbech changed their tactics for the second half and took the game to Barnes who were put under pressure for long periods. However, with 15 minutes to go Barnes capitalised on one of their chances and went 1-0 up. As Wisbech searched for the equaliser and became more attack-minded, Barnes scored their second against the run of play. Captain Laura Overland said: “I’d like to say a huge thank-you to all the travelling supporters that were amazing from the sidelines and were by far the biggest and loudest crowd of the day.